NuSphere PhpDock - unique php deployment solution. Sample php application. PhpDock installation program also installs PhpDock Currency Converter - simple but very educational PHP Application, which allows the User to convert various currencies to one another. The illustration below shows Currency Converter Application in PhpDock. PhpDock Currency Converter makes use of Sqlite, Web Services and NuSphere's NuSoap library for Web Services in PHP. The User is free to redistribute PhpDock Currency Converter as long as the references and links to NuSphere's web site are left intact. PhpDock Currency Converter is developed entirely in PhpED, world's leading PHP IDE provided by NuSphere. PhpED's Db Wizzard and NuSoap client features were crucial for development of Sqlite layer and Web Services client code. 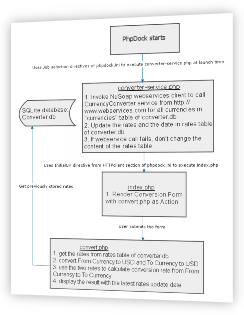 The following diagram is a brief overview of PhpDock Currency Converter application. PhpDock Currency Converter consists of four sets of PHP scripts and Sqlite database file. The user interface is database driven - the list of currencies available for conversion is dynamically generated from "currencies" table of converter.db Sqlite database. This script is executed by PhpDock when the program starts as directed by Job section of PhpDock.ini file. converter-service.php is written with the help of NuSoap client of PhpED PHP IDE. It calls http://www.webservicex.com CurrencyConverted service to update the rates table of converter.db Sqlite database. NuSoap scripts implement NuSphere NuSoap Web Services library. These scripts are installed to <PhpDockinstall directory>\PhpDock\web\lib folder and used by converter-service.php to send the requests to CurrencyConverter service. The user can obtain more information about NuSphere's NuSoap library from NuSoap Forum on NuSphere's Forums. This is a utility script which implements SqliteDB class encapsulating Sqlite database connection layer. Sqlitedb.php is written with the help of DB Client available in of PhpED PHP IDE. The user can study the schema of the tables using DB Client available in PhpED PHP IDE.